The manual is designed to guide the educator, parent or health care professional. It gives step-by-step instructions on the use of the storybooks and workbooks. It includes suggested lessons tied to standards, assessments, and resources. Group and individual fun activities are included in the workbooks. You may download a few select activities here. You may download and print the assessment pages here. For further information, refer to the assessment section in the Facilitator/Teacher Manual. 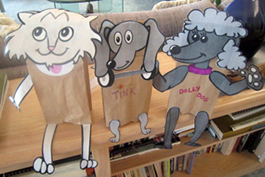 The paper bag puppets can be used for storytelling, sharing, and role-playing. 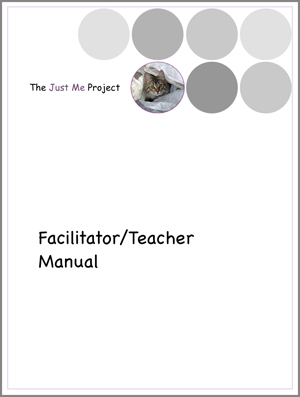 They are available in hard copy in the workbooks and as a downloadable file here. 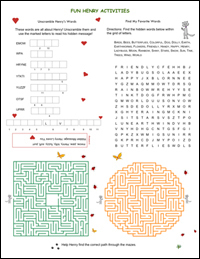 The paper place mats contain fun activities such as connect-the-dots, mazes, and puzzles. They can be used in lunch trays at hospitals, in activity centers, or at home. They are available in hard-copy form at the Henry’s World Store and as downloadable files here.